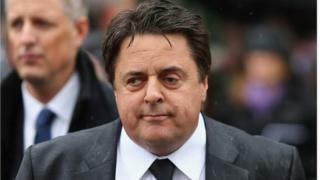 The British National Party says it has expelled its ex-leader Nick Griffin. In a statement, the BNP accused him of trying to "destabilise" the party and "harassing" party members. In a tweet, Mr Griffin took issue with the decision, accusing the party leadership of "plastic gangster games". Mr Griffin stepped down as party leader in July after 15 years at the top. The party saw its vote collapse in May's elections, in which Mr Griffin lost his seat in the European Parliament. The BNP said the decision to expel Mr Griffin had been taken by its conduct committee following an investigation after he stepped down as leader. It accused him of seeking to "destabilise" the party and "embroil it in factionalism". Specifically, it claimed Mr Griffin prepared and leaked "damaging and defamatory" allegations about senior members of the party and its finances. It also accused him of "harassing members of BNP staff and in at least one case making physical threats" as well as publishing e-mails giving a false account of his own financial affairs after he was declared bankrupt in January. It also suggested that he had ignored warnings from Adam Walker, the party's chairman, that he was bringing the BNP into disrepute. "Although we all appreciate that Nick has achieved a lot for our party in the past, we must also remember that the party is bigger than any individual," Clive Jefferson, a member of the conduct committee, said in a statement. "Nick did not adjust well to being given the honorary title of president and it soon became obvious that he was unable to work as an equal member of the team and alarmingly his behaviour became more erratic and disruptive." Why the fuss over the internal machinations of a party which has no MPs, no MEPs - and which polls suggest commands the support of about one per cent of voters? Well, for many people Nick Griffin was the BNP, and his personal - and his party's - fortunes appeared intertwined. But 2014 hasn't been a good year for him. He lost his seat in the European Parliament, was declared bankrupt, replaced as party leader and has now been expelled from the party. He says he will not '"resort to the BBC gutter" to air his grievances - the members will sort it all out, he says. But a political comeback looks like a very tall order. In response, Mr Griffin said he had been "expelled without a trial". He accused the party of "operating outside the constitution", adding that he would "ignore their plastic gangster games". Mr Griffin has been the public face of the BNP for more than a decade, during which time the party increased its popular support despite being dogged by allegations of racism, which it has always rejected. But the BNP's fortunes have slumped in recent years amid internal divisions and questions over the party's future direction. While it won more than 6% of the vote in the 2009 European elections, when Mr Griffin and one other colleague were elected, it garnered just over 1% of the vote in May. The party has also lost the majority of its council representatives. Mr Griffin told political correspondent Ross Hawkins that he would not speak to the BBC about the dispute but insisted he would "sort it out" with party members. The party's divisions, he added, were linked to its slump in electoral support since 2009 but observers also claimed that there had been arguments over the party's financial affairs. What now for Nick Griffin?